Liverpool FC's tenth European Cup last four tie comes against an AS Roma side who've waited to reach this stage since the two teams met in the 1984 final. 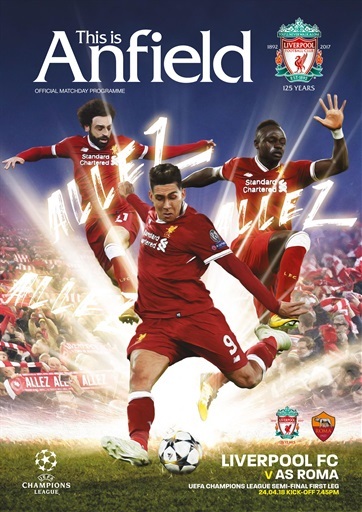 Inside tonight's official matchday programme manager Jürgen Klopp urges everyone connected with LFC to embrace the moment as much as our successful past with the Road to Kiev now only two games away. Elsewhere, we have interviews with Andy Robertson, Jordan Henderson and Roberto Firmino, a look back at LFC's previous European Cup semi-final ties while The Big Read recalls Jürgen Klopp's memorable run to the final of this competition in 2012/13. All this and much, much more in the official matchday programme which is on sale now.